Food poisoning usually occurs whenever you swallow either food or the water that is supposed to contains the bacteria or parasites or viruses or sometime it contains the toxins made by the germs as a result of which the poison reaches to the body and hence causes food poisoning in the body. Most of the cases of the food poisoning problems are from the common bacteria which can be named as the Staphylococcus. It is the food poisoning which is supposed to be a very dangerous cause of death of the person to whom it happens. The food poisoning may be caused by any one of the following reasons. 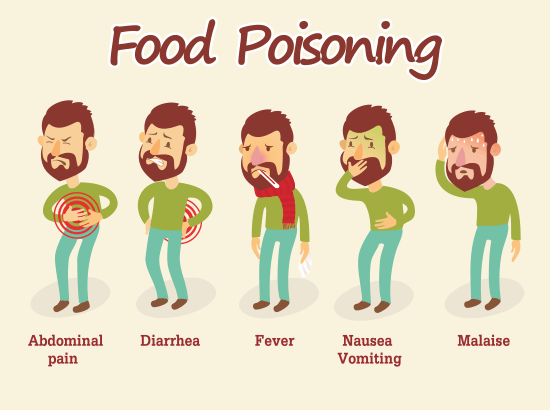 Food poisoning is such a problem that can for sure affect any one person or sometime it can also affect a group of the people that all have taken the same food which was supposed to be contaminated food. It sometime more commonly known to be occurred to the people only after eating at the sensitive and wrong places like at the picnics, or school cafeterias, or at some of the large social functions, or sometime also at some of the restaurants and hotels. In this way the germs get in to the stomach of the person who eats them as a result of which food poisoning occurs to the person. Any food which is prepared by some people who do not wash the hands in a proper way. Any food which is prepared by using the cooking utensils or cutting boards or from some of the other tools which are not supposed to be cleaned fully. Sometime the frozen or the refrigerated foods are not supposed to store at some of the proper temperature and they are not usually reheated properly due to which problem occurs.